Veneers may be right for you if you aren’t happy with your smile. These thin tooth coverings can conceal an array of imperfections such as tooth discolouration, shape variations and more. Veneers represent a quick way to fix your smile if you don’t want to straighten your teeth using braces or aligners that may take up to two years. They are generally used on the top front 6-8 teeth. The material that’s right for you depends on what your expectations are. Our dentists are happy to discuss what is most appropriate for your particular case. At your first appointment, we will collect all your records and take pictures and moulds of your teeth. Your dentist will perform a detailed exam of your gums, teeth and bone, and assess your occlusion (bite). Once we have all the records we will have you visit our ceramist at a local lab who will create a 3D design of your smile and make a wax trial of what your teeth will look like with ceramic veneers on. If you’re happy with how your veneers look, we can use that wax trial to make temporary plastic veneers, and we can put them on for a week or two. This test drive also will allow us to determine if the veneers affect your speech. We can make any adjustments such as lengthening a tooth to ensure you are completely satisfied. If you are pleased with how your veneers look we can then proceed to prepare your teeth and then take moulds to send them to the local lab where they will be used to fabricate your veneers by hand. The world-class lab is only a 5-minute walk from the practice. You don’t need a trial phase with composite Veneers, however, you can opt for it at an additional cost. The trial phase is most beneficial when you’re going to be removing tooth structure (ceramic/porcelain veneers). With composite veneers, you’re not taking away any tooth structure so we can have them fabricated for you straightaway. It’s always safer, however, to go for a trial first. We will have you return to have your veneers bonded to your teeth. What are the advantages and disadvantages of ceramic or porcelain veneers? They change the smile or appearance of a person’s teeth with minimal prepping. Ceramic veneers have a much better resistance to fracture and they hold the colour longer than composite veneers. One disadvantage of ceramic veneers is they do require some removal of tooth structure. You have to remove about 0.3 millimetres from the front of the tooth and can go up to 1-1.2 millimetres of reduction. Ceramic veneers also cost more than composite ones at about $1200 per tooth. 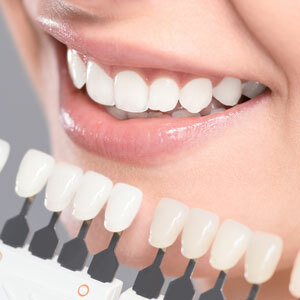 What are the advantages and disadvantages of composite veneers? With these veneers, no tooth structure needs to be removed. You just add them on to the current teeth. Composite veneers are also less expensive than porcelain ones at about $750 per tooth. These veneers can be done in a single visit. Ceramic veneers last between 7-15 years but you likely will need new ones after 10 years. We find that any nervousness arises due to lack of information and preconceived notions that patients would have about the procedure. We will provide numbing before we begin, and if you have severe anxiety, we can provide nitrous oxide. Many health funds cover veneers but it depends on the level of cover you have and your particular health fund. I don’t have insurance. Do you offer any payment plans? Yes; we offer My Smile Plan and MediPay, which allow you to finance your veneers affordably. If you’d like to transform your smile with veneers, contact Fortitude Valley Dentist today to schedule a consultation! Take advantage of 0% interest free financing plans. Take advantage of our great value – it’s just $199* for an examination, cleaning and take-home whitening kit! (*or GAP only with health insurance, offer valid for new and returning patients). Book your time today. Free consultations for all dental treatments and easy payment plans available! Contact us now.